Some services are worth paying for. In 2017, however, pay TV and home phone service should absolutely not be on that list. People waste so much money on cable and home phone service, and all that cash could be put to much better use elsewhere. “But I don’t want to miss any primetime TV,” you say. “But I don’t trust my cell phone alone for phone service,” you say. Fine, there’s nothing wrong with either of those statements. You should be able to watch live primetime TV, and you should be able to have a home phone with a dedicated number. Our point is this: You don’t have to pay for either of those things. 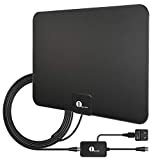 Check out the 1byone Amplified HDTV Antenna, which will get you free network TV in gorgeous 1080p full HD resolution forever, and the Ooma Telo, which will get you free home phone service for life. Don’t worry, you can thank us later. FREE FOR LIFE – Never Pay Your Cable or Satellite For Television Again! 1byone antenna can pull in all of your local news, weather, sitcoms, kids and sports programs absolutely FREE. Just connect it to your television and let the antenna do all the work. 10FT LONG CABLE – Makes it easier for you to place it in your house to get the best reception, especially for customers whose televisions are quite far away from windows. WHAT WE CARE – Our biggest concern isn’t with earnings or profits; It’s with customers’experiences purchasing and using our products. We want satisfied customers and to develop trust in the 1byone brand. Simply contact us if you have issues with your antenna. As with any antenna, you may find many variables contribute to your antenna’s performance. If your antenna is not working as expected, try one of the following: 1.) Check the antenna is correctly connected to your HDTV or 3rd party HD receiver. 2.) Set the mode to Antenna or Air in the TV’s setup menu and re-scan for channels. 3.) Antenna signal strength can vary depending on distance from the tower, terrain, and weather. If needed, reposition the antenna in a different location. It is best to place the antenna in line of sight with the TV tower(s) and avoid obstructions. Always re-scan for channels after moving the antenna. 4.) This is an amplified antenna; If a signal cannot be received with the external amplifier, remove the amplifier and try again. In some instances, the amplifier may cause self-oscillation, which may interfere with the signal.